When you first time define a value in Chisel (i.e. during the val declaration), we use the = operator in order to tell Chisel to allocate the value for the first time. On every subsequent reassignment to the value, we must use a := when reassigning the value. Since we are constructing a digital circuit, the notion of reassignment does not make much sense since connections between circuit nodes only need to be specified once (at least for structural description of modules, i.e. decomposition of modules into submodules). However, there are some cases when we will need to perform reassignment to a value in Chisel since it is compiled sequentially unlike Verilog. Thus it may be necessary to perform reassignment when a value or connection is not known until later in the Chisel source. In addition to that, reassignment is useful in behavioral description of circuits (e.g. synchronous always blocks in Verilog and processes in VHDL). A simple example of when reassignment is necessary is in the construction of the top level I/O for your module; the values of the output are not immediately known at the time of declaration. Consider the simple FullAdder circuit from previous tutorial that determines the sum sum and carry out cout given two values a and b, and a carry in cin. In this example we make sure to use the := reassignment for the io.sum and io.cout output values because we only know what they’re values are later in the code and not at the time of construction of the io instance of Bundle. All other values in this example use the = assignment operator since they need to be created. In general, the rule of thumb is to use the reassignment operator := if the value already has been assigned by the = operator, otherwise the = operator should be used. Note that if you do not use the = or := operators correctly you will get an error when you try and compile your design. First thing to note, is that we snuck in a quick one on you :-) The way that the io bundle is defined is different -- this is because this is Chisel 2 code. Rocket Chip was written in Chisel 2, and much of it remains in Chisel 2. However, all new development is now in Chisel 3. The syntax differences are minor, like this. More about Chisel 2 on Chisel-Versions page. Safe to ignore, but just be aware that if syntax looks slightly different, it's probably due to Chisel 2 vs Chisel 3 difference. In particular, if you see at the top of the .scala page this import: import Chisel._ then that means that the code on the page can be either Chisel 2 or Chisel 3. Now, you can mix Chisel 2 syntax with Chisel 3 syntax on the same page. You will notice that there are multiple reassignments to io.output inside a when block which indicates that the value of io.output can take many different values depending on the io.opcode in this example. Also notice that in order to specify constants to add to our operands, we must also specify them as a UInt type as UInt operations on different type operands is not allowed. Chisel does not automatically convert data types, so you must do the conversions explicitly. Note that the higher index is specified first in the argument list when extraction the bits. Also notice that the bits in the UInt are zero indexed so the highest bit that can be extracted from an n bit wide value is n-1. Note that the values A and B are declared as Wire during the value declaration. Type-only vals (no associated data) must be wrapped in a Wire() if they will be the destination of a wiring operation (":=" or " < >"). The wrapping of UInt into Wire is required from Chisel 3. The val bus does not need to use the Wire word because the bus is not reassigned with :=. In other words, the values that are only declared but not yet defined need to use Wire. The values that are already defined during declaration do not need to use Wire. The first argument to Cat will be placed in the high part while the second argument gets the low part of bus. Thus for this example bits 0 to 31 of bus correspond to B, while bits 32 to 63 correspond to A.
until your circuit passes the tests. Note that for some operations such as addition and multiplication, that number of resulting bits of the computation can be greater than the number of bits for the operands. Consider the following example where we multiply two 16 bit numbers A and B together. Note that the product of two 16 bit numbers is, at worst, 32 bits wide. The Bool class in Chisel is used to represent the result of logical expressions and takes either the values true or false. These can be used in conditional statements such as when blocks. When assigning values, it is required that you assign a value of the same type. For instance, if you try to assign a Bool type to an output value that is expecting a UInt type, you will get an error because value types are not converted automatically. Like other hardware description languages, Chisel allows fairly straightforward module instantiation to enable modularity and hierarchy. In Chisel, instantiating a Module class is the equivalent to instantiating a module in Verilog. To do this, we simply use a call to Module with module created with the Scala new keyword in order to indicate that we are instantiation a new module. We want to make sure we assign this to a value so that we can reference its input and outputs which we also need to connect. 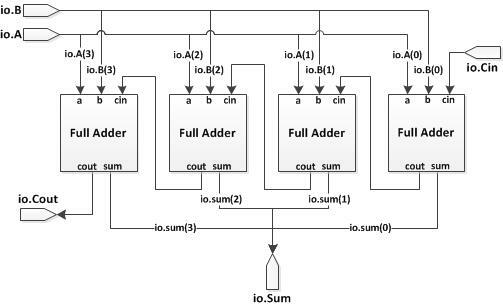 For example, suppose we would like to construct a 4-bit adder using multiple copies of the FullAdder module. The Chisel source code is shown below. In this example, notice how when referencing each module I/O we must first reference the io that contains the ports for the I/Os. Again, note how all assignments to the module I/Os use a reassignment operator :=. When instantiating modules, it is important to make sure that you connect all the input and output ports. If a port is not connected, the Chisel compiler may optimize away portions of your design that it find unnecessary due to the unconnected ports and throw errors or warnings. Where <number of elements> corresponds to how long the vector is and <data type> corresponds to what type of class the vector contains. Vector of Registers is strongly advised not to be used. Notice we use the keyword new in the vector definition before the module name FullAdder. For how to actually access the io on the vector modules, refer to the next section. Note that in this example, we keep track of the sum output in a Vec of Bools. This is because Chisel does not support bit assignment directly. Thus in order to get the n-bit wide sum in the above example, we use an n-bit wide Vec of Bools and then cast it to a UInt(). You will notice that modules are instantiated in a Vec class, which allows us to iterate through each module when assigning the ports connections to each FullAdder. This is similar to the generate statement in Verilog. However, you will see in more advanced tutorials that Chisel can offer more powerful variations. All of the above definitions pass the same parameters to the FIFO module. Notice that when you explicitly assign the parameter values, they can occur in any order you want such as the definition for fifo3. Although parameters can be passed explicitly through a Module’s constructor, this technique does not scale when parameterizing large designs with many generic components. For a more detailed explanation of why a better parameterization method is needed, please see the Advanced Parameterization Manual. In addition, this manual explains heuristics for how to organize and parameterize large designs, which we highly recommend one reads prior to using this functionality in a design. The following, however, is a basic introduction. Every Module has its own params object, which acts as a dictionary. Querying this object is shown below. If params is queried and no parameter matches the query, Chisel throws a ParameterUndefinedException. Notice the query return type must be provided. When a parent Module creates a child Module, the parent’s params object is automatically cloned and passed to the child. In the following example, suppose the parent’s params object returns 10 when queried for width. Because the Parentparams object is automatically cloned for Child, the Child query also returns 10. However, our custom MyRouter Module requires a parameter, RoutingFunction that we want to sweep for a design space evaluation. Using the simple parameterization method would require a change to the Mesh Module’s constructor to include RoutingFunction. For more advanced uses, tips, and tricks, please see the Advanced Parametrization Manual, in the Documentation section of the website or the doc/parameters directory of the git repo. This is an evolving area and the documentation may not be as up-to-date as the code. Like other HDL, Chisel provides some very basic primitives. These are constructs that are built in to the Chisel compiler and come for free. The Reg, UInt, and Bundle classes are such primitives that have already been covered. Unlike Module instantiations, primitive do not require explicit connections of their io ports to use. Other useful primitive types include the Mem and Vec classes which are discussed in an advanced page about Memories In Chisel. In this tutorial, we explore the use of the Mux primitive. The Mux primitive is a two input multiplexer. In order to use the Mux we first need to define the expected syntax of the Mux class. As with any two input multiplexer, it takes three inputs and one output. Two of the inputs correspond to the data values A and B that we would like to select which can be any width and data type as long as they are the same. The third input select which is a Bool type determines which one to output. A select value of true will output the first value A, while a select value of false will pass B. Thus if A=10, B=14, and select was true, the value of out would be assigned 10. Notice how using the Mux primitive type abstracts away the logic structures required if we had wanted to implement the multiplexer explicitly. 1: For details, see this discussion.